These are some of the first hand stories, collected by the Anti-Racism Movement and its Migrant Community Centre (MCC) over the past two years. These testimonies highlight the personal experiences and day-to-day violence and discrimination faced by migrant domestic workers in Lebanon. 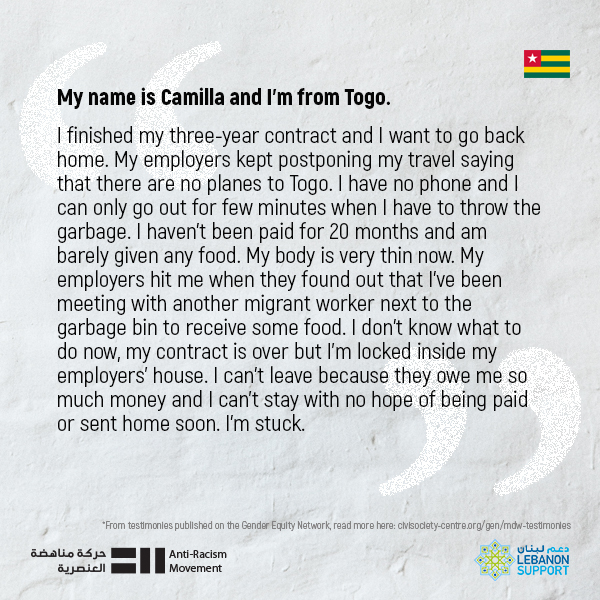 These personal testimonies aim, thus, to showcase how the kafala (sponsorship) system affects and, sometimes dictates, the lives of migrant domestic workers, leaving them with very limited options. The names of individuals in the below stories have been changed to maintain their safety. This qualitative content has been developed as part of an active collaboration between Lebanon Support and Anti-Racism Movement, and is within the data centre of the Gender Equity Network. Hover over the slideshow to pause it, and click on the picture to be able to share the story. 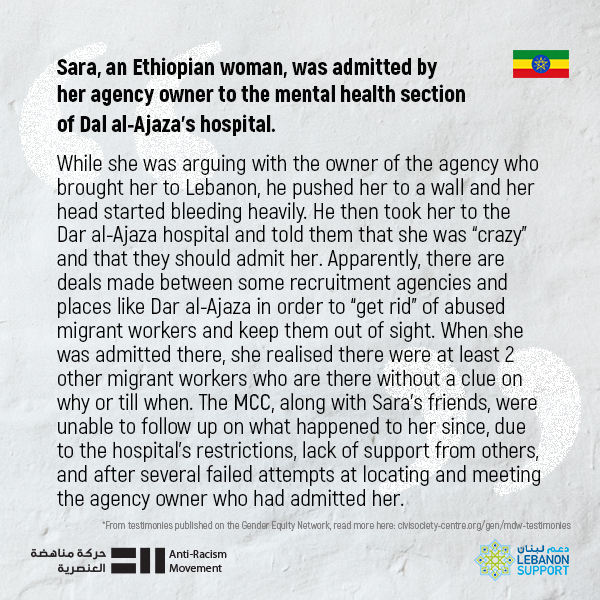 Sara, an Ethiopian woman, was admitted by her agency owner to the mental health section of Dal al-Ajaza’s hospital. She met some Ethiopian members of the Migrant Community Centre (MCC) in 2016 and told them that while she was arguing with the owner of the agency who brought her to Lebanon, he pushed her to a wall and her head started bleeding heavily. He then took her to the Dar al-Ajaza hospital and told them that she was “crazy” and that they should admit her. Apparently, there are deals made between some recruitment agencies and places like Dar al-Ajaza in order to “get rid” of abused migrant workers and keep them out of sight. When she was admitted there, she realised there were at least 2 other migrant workers who are there without a clue on why or till when. The MCC, along with Sara’s friends, were unable to follow up on what happened to her since, due to the hospital’s restrictions, lack of support from others, and after several failed attempts at locating and meeting the agency owner who had admitted her. 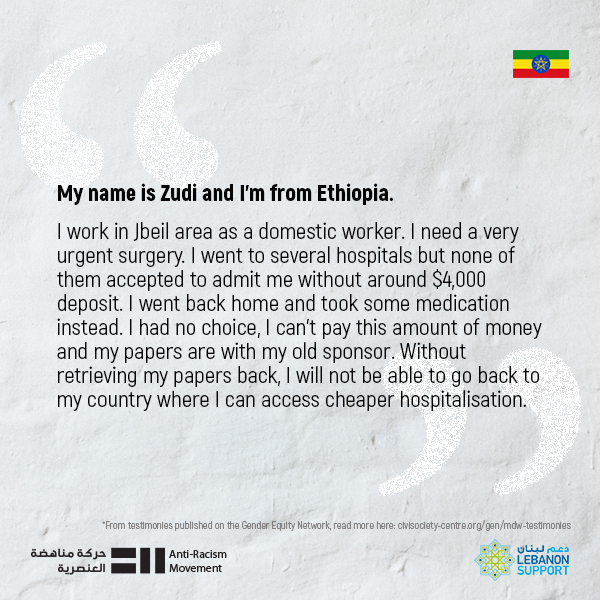 My name is Zudi and I’m from Ethiopia. I work in Jbeil area as a domestic worker. I need a very urgent surgery. I went to several hospitals but none of them accepted to admit me without around $4,000 deposit. I went back home and took some medication instead. I had no choice, I can’t pay this amount of money and my papers are with my old sponsor. Without retrieving my papers back, I will not be able to go back to my country where I can access cheaper hospitalisation. My name is Camilla and I’m from Togo. I finished my three-year contract and I want to go back home. My employers kept postponing my travel saying that there are no planes to Togo. I have no phone and I can only go out for few minutes when I have to throw the garbage. I haven't been paid for 20 months and am barely given any food. My body is very thin now. My employers hit me when they found out that I’ve been meeting with another migrant worker next to the garbage bin to receive some food. I don’t know what to do now, my contract is over but I’m locked inside my employers’ house. I can’t leave because they owe me so much money and I can’t stay with no hope of being paid or sent home soon. I’m stuck. 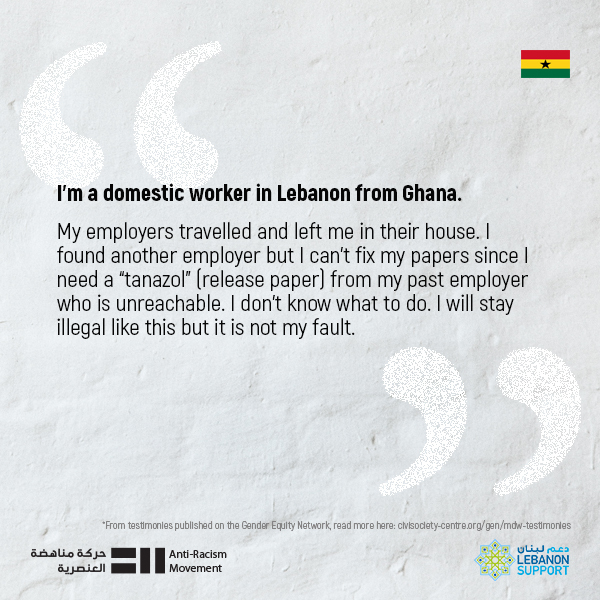 I’m a domestic worker in Lebanon from Ghana. My employers travelled and left me in their house. I found another employer but I can’t fix my papers since I need a “tanazol” (release paper) from my past employer who is unreachable. I don’t know what to do. I will stay illegal like this but it is not my fault. 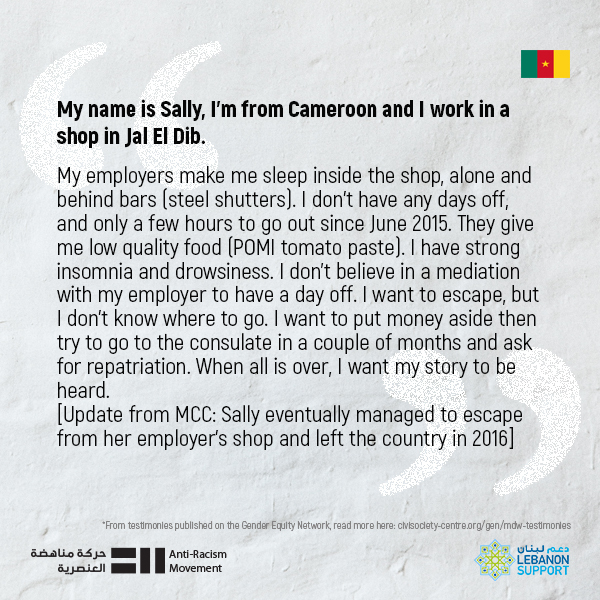 My name is Sally, I’m from Cameroon and I work in a shop in Jal El Dib. My employers make me sleep inside the shop, alone and behind bars (steel shutters). I don’t have any days off, and only a few hours to go out since June 2015. They give me low quality food (POMI tomato paste). I have strong insomnia and drowsiness. I don’t believe in a mediation with my employer to have a day off. I want to escape, but I don’t know where to go. I want to put money aside then try to go to the consulate in a couple of months and ask for repatriation. When all is over, I want my story to be heard. 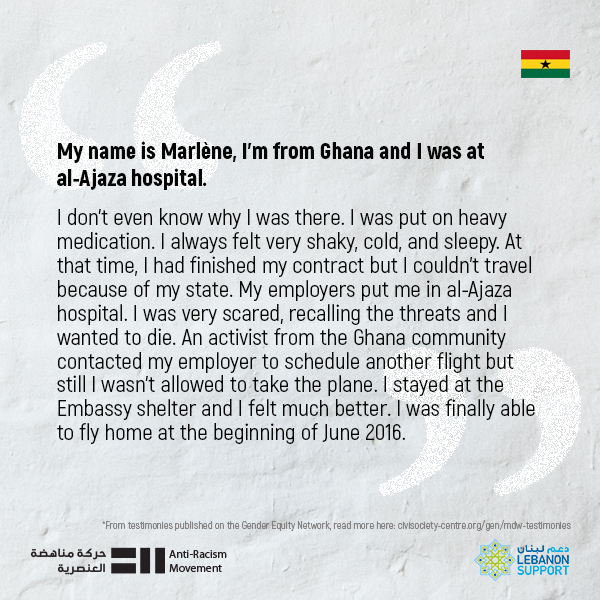 My name is Marlène, I’m from Ghana and I was at al-Ajaza hospital. I don’t even know why I was there. I was put on heavy medication. I always felt very shaky, cold, and sleepy. At that time, I had finished my contract but I couldn’t travel because of my state. My employers put me in al-Ajaza hospital. I was very scared, recalling the threats and I wanted to die. An activist from the Ghana community contacted my employer to schedule another flight but still I wasn’t allowed to take the plane. I stayed at the Embassy shelter and I felt much better. I was finally able to fly home at the beginning of June 2016. 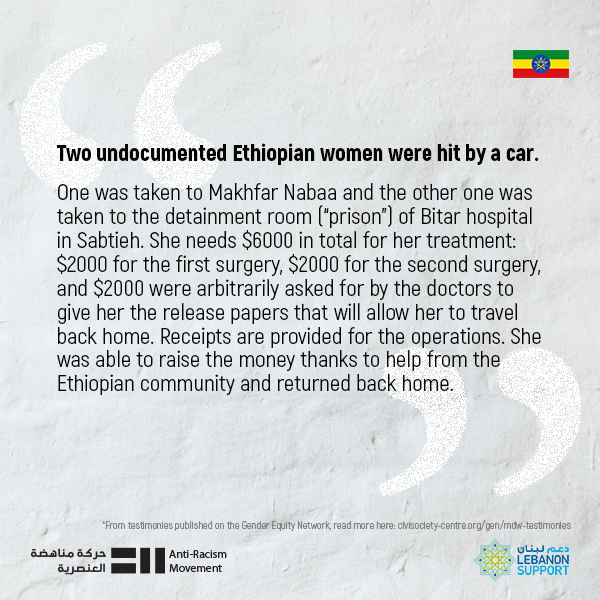 Two undocumented Ethiopian women were hit by a car. One was taken to Makhfar Nabaa and the other one was taken to the detainment room (“prison”) of Bitar hospital in Sabtieh. She needs $6000 in total for her treatment: $2000 for the first surgery, $2000 for the second surgery, and $2000 were arbitrarily asked for by the doctors to give her the release papers that will allow her to travel back home. Receipts are provided for the operations. She was able to raise the money thanks to help from the Ethiopian community and returned back home. 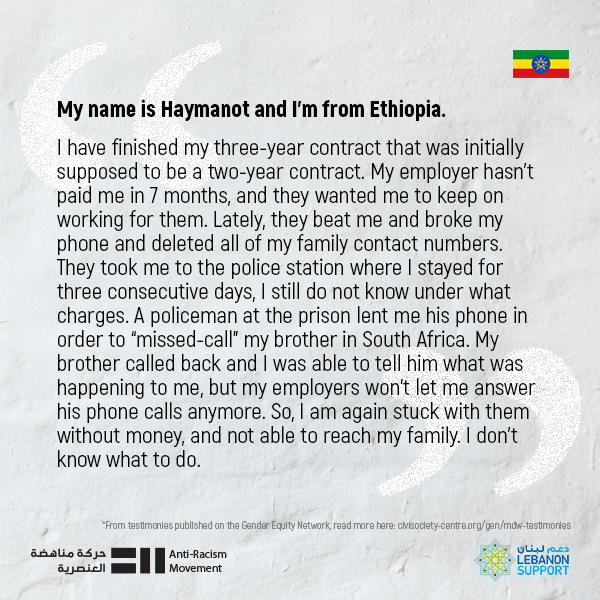 My name is Haymanot and I’m from Ethiopia. I have finished my three-year contract that was initially supposed to be a two-year contract. My employer hasn’t paid me in 7 months, and they wanted me to keep on working for them. Lately, they beat me and broke my phone and deleted all of my family contact numbers. They took me to the police station where I stayed for three consecutive days, I still do not know under what charges. A policeman at the prison lent me his phone in order to “missed-call” my brother in South Africa. My brother called back and I was able to tell him what was happening to me, but my employers won’t let me answer his phone calls anymore. So, I am again stuck with them without money, and not able to reach my family. I don’t know what to do. 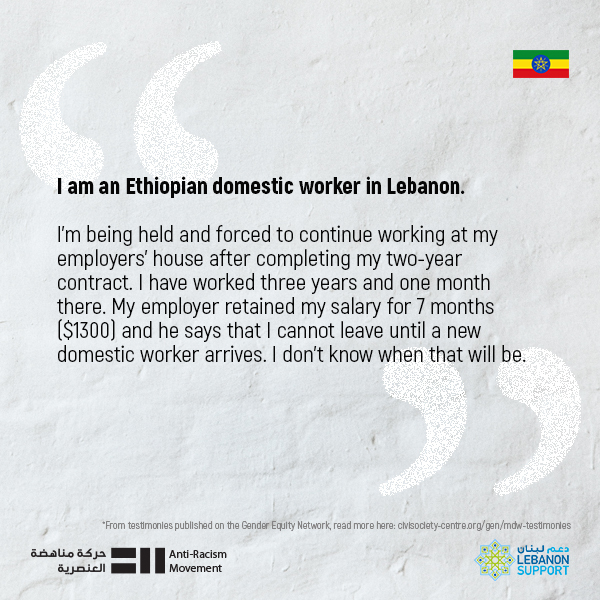 I am an Ethiopian domestic worker in Lebanon that is being held and forced to continue working at my employers’ house after completing my two-year contract. I have worked three years and one month there. My employer retained my salary for 7 months ($1300) and he says that I cannot leave until a new domestic worker arrives. I don’t know when that will be.